by Susan Jones (CNS News) : A record 94,708,000 Americans were not in the labor force in May -- 664,000 more than in April -- and the labor force participation rate dropped two-tenths of a point to 62.6 percent, near its 38-year low, the Labor Department's Bureau of Labor Statistics reported on Friday. 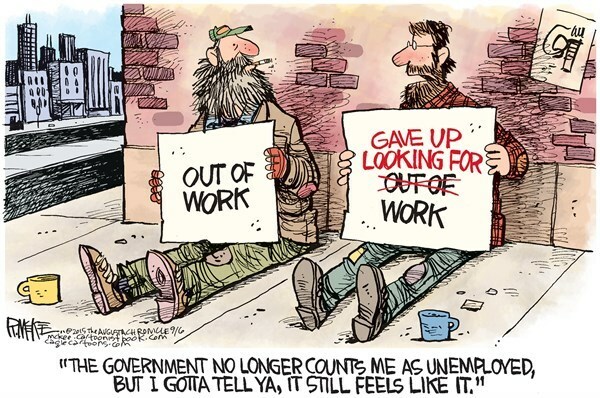 Tags: unemployed, underemployed, labor participation drops, Susan Jones, CNS News, editorial Cartoon, Rick McKee To share or post to your site, click on "Post Link". Please mention / link to the ARRA News Service. and "Like" Facebook Page - Thanks! I would love for the media to ask this question; Mr. President, how many Americans are not in the labor force? So tell me how can unemployment only be 5%?? That is almost 1/3 of the American population!